Cleaning the house. It has to be done, I know. Not one of my favourite things to do though. We have no carpets in our house, so it’s a lot of sweeping and mopping. Add in a kid and a guinea pig who likes to wander and it’s a lot of little messes to clean up. I also have long hair, which somehow is always getting tangled on the broom and gets really gross to take off. What are your cleaning issues? 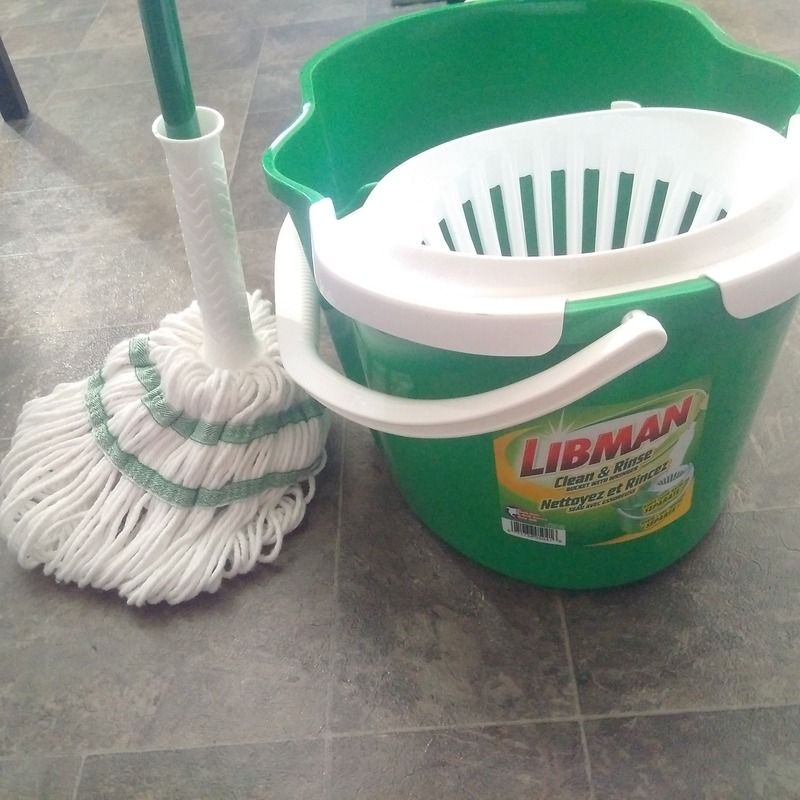 When Libman asked me to try some of their items out, I was actually excited for it. All of their products can be used with any product you want – we stick to vinegar and water, so that’s a big thing for us. You’d think it was Christmas morning when their stuff arrived….but, it was almost like they had been reading our minds! An upright dustpan with teeth that you can use to remove long hair and things that tangle up brooms – yes! 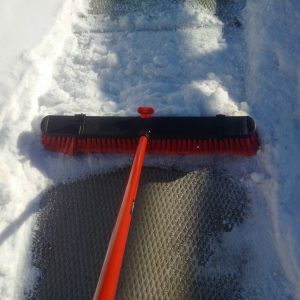 A wide broom to make clean up even faster – yes! Simple and easy to use and clean mops for every type of flooring – yes! One of my fave items is the no knees floor scrubber – stiff brush for really stuck on messes! Can use it in the bathroom, kitchen etc. I think it’ll be awesome for giving the garage a great clean up this spring too! My absolute fave item though is the Freedom Spray Mop. And they aren’t kidding with the name, really. This is total freedom for mopping. Fill up the tank with whatever you want – we just did vinegar and water. Pull the trigger and a huge spray of water comes out. It covers so much, like exactly the perfect amount of where you’re mopping. I find now that even when you go to mop just one room, you mop the whole house because it’s so quick and simple. Makes it easy to clean in tight spots too, and you can reuse and wash the pad up to 100 times. And best part – it’s fun for kids to use! They have more traditional mops too if that’s more your thing – easy to wring out and reuse over and over again. Great outdoor broom too, which is something every house needs. Quick snow clean up, leaves etc. are no match for this super wide broom! Giveaway is open to all Canadians and will end Friday March 2nd at noon! Good Luck everyone! ****CLOSED – Congrats to Susan C. who wins the big kit! The taste I dislike most is ironing. I dislike sweeping the floors. I do it, but if I can pass it off to someone else… then I will. The No Knees floor scrub is a must have! That is the product I’d like to try first. & Liked Libman products on FB. Thanks! I want to try the wondermop ? 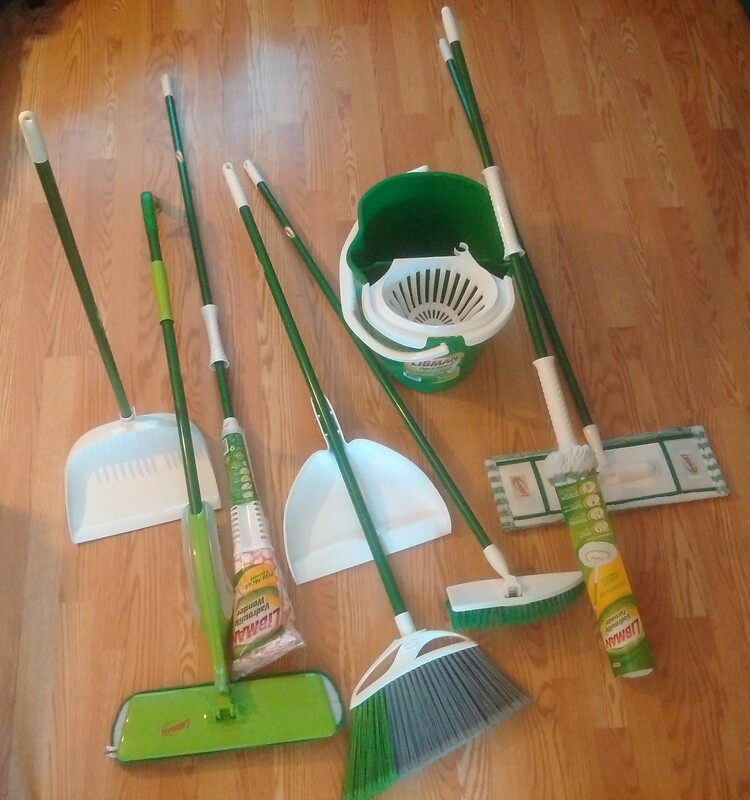 I liked the Libman Company on Facebook, and posted a link to the giveaway on my FB page. The cleaning job that I dread the most is cleaning our bath tub. We have hard water and it leaves yellow stains on the tub. The Libman cleaning product I would like to try out is the EXTRA LARGE MICROFIBER FLOOR MOP. I would love to try their microfiber dust mop. Shared this link on FB. The cleaning job I dead the most is the bathtub because it hurts my back and it’s hard to clean. I liked Libman on facebook! I dread cleaning the shower! I the cleaning job I dread the most is the glass shower doors. The Libman cleaning product I like to try out is the Freedom Spray Mop. I hate cleaning the floors the most. I hate vacuuming the most because I have to pick up all the toys first ? I would check out the wonder broom! Looks awesome! I dislike dusting. I would like to try the step on dustpan. Thanks! I’d like a push broom as I recently broke mine. My dreaded job is cleaning floors. I hate dusting, seems it is a never ending chore. I would like to try the wonder mop. I usually wash my floors by hand, but it is getting harder as I get older. Shared your giveaway on my timeline. Bathrooms are my least favourite by far! Would like to check out the No Knees Floor scrub. Would save my back! The toilet is the worst to clean for sure! Spiral sweep broom looks fun to use! My least favourite place to clean is the shower and shower door! I would love to try the no knees floor scrub. Shared link on Facebook and liked Libman on Facebook. I dislike mopping my floors. It is difficult to find a time where my family won’t be walking through them and I still have energy to do them. I still haven’t quite figured out how to make them beautifully streak-free. After checking out the website, I would love to try mopping with the freedom spray mop. I’ve liked the Libman Company. I dread washing the floors! The task I dislike the most is sweeping. I would like to try the 4 gallon ckean and rinse bucket with wringer. Where has this been all my life? I hate cleaning the floors due to all the dog fur everywhere!! Cleaning up cat puke ranks as the absolute worst, but I hate all the cleaning. That Wonder Mop looks pretty snazzy. I’d love the no knees floor scrub! Dusting is what I dread most!! I really dislike sweeping as the dog hair always seems to run away from me lol. And I hate windows. Would like to try the Freedom Spray Mop. I have shared this on Facebook and I have liked Libman on Facebook. Thank you for the opportunity. The chore I dread the most is washing floors! Seems like it always needs to be done. I’d most like to try the microfiber Wonder Mop. I dread cleaning the bathroom. I would like to try the Freedom spray mop. Busy house needs help with easy to use cleaning products. Shared on Facebook! Dishes. I hate them so much! Not very fond of floor cleaning, but it has to be done. All. I dread ALL cleaning. I’d love to try the no knees floor scrubber first! Shared on facebook! I’d love to try the freedom spray mop. I love having the liquid solution attached to the mop. It means that both my hands can maneuver the mop itself. I ‘liked’ the Libman company on facebook. .All the cleaning products look great. Liked&shared on Facebook. Checked out the Libman Company.. Thanks for the opportunity to win. Wanna try that Wondermop, Baby!